The climatological database for the world’s oceans, CLIWOC compiled the world’s oceans meteorological database from 1750 to 1850. 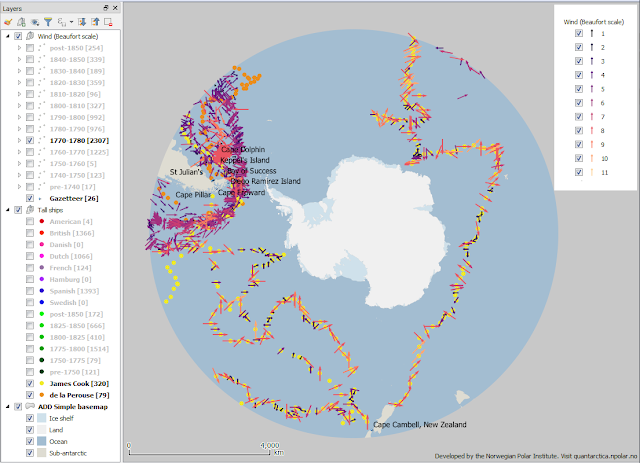 The Dutch Meteorological Institute led the digitising of tall ships captains' log books mostly from Britain, France, Holland & Spain - crucially considering their many voyages, this did not include data from Portugal - pre-1850 climate data along ships tracks complement the more widely available offshore and onshore climate data worldwide after 1850. From Norwegian Polar Institute website, "Quantarctica is a collection of Antarctic geographical datasets which works with the free, cross-platform, open-source software QGIS. It includes community-contributed, peer-reviewed data from ten different scientific themes and a professionally-designed basemap. Best of all, Quantarctica is free to download and re-distribute." I chronicled the story of posting captains ships logs data, first for for tall ship locations then for climate especially wind data, from an EU project to digitise mainly British, Dutch, French and Spanish data. I was recently alerted that the Norwegian Polar Institute (NPI) updated their dataset on Antarctica under Creative Commons license as Quantarctica v.3. I also had just installed QGIS v.3 for an upcoming class in a Visiting Geoscientist Program, so I downloaded NPI's newest release from just last month. What piqued my interest was their polar azimuthal projection (EPSG 3031), which contrasts with the generic WGS84 (EPSG 4326): can I extract data south of 40 South Latitude from the CLIWOC dataset I posted on my private AWS (Amazon Web Services) stack? Please see the full detail of my submittal to Quantarctica on my companion Maps blog here. See also ESRI helping go beyond the desktop back to the web on a mega-data subset here.